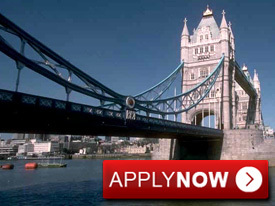 Experience the United Kingdom, a unique blend of different cultures, nationalities and lifestyles! With its impressive castles, long- established pubs, great shopping, stunning landscapes, museums and majestic homes, extreme fashion, trendsetting music and outstanding theatre, the UK is a great destination for young travellers. Nothing beats living and working in Britain for an extended period of time to really get to know the country from the inside. Type of job	 Entry-level and semi-skilled jobs. Salary (other benefits) GBP 6.00 per hour up to GBP 15.00, depending on the job. Accommodation Applicants find their own accommodation. Hostel booking up to 5 nights possible. See packages below. Location of job placement Mostly London. Duration of the placement	 Up to 2 years. Eligibility. Who can apply? Candidates must be aged between 18 and 30. See Application process in more detail. Visa Required	 Working Holiday Visa for non-EU citizens. Programme cost GBP 100 – 350, depending on the package. If the applicant cancels before Global Choices conducts any processing, the full paid amount is refundable. Cancellations received after being accepted to the programme are subject to a refund of the fee less GBP 50. The participant is not eligible for a refund once he/she has entered the UK. Global Choices has several options to suit your needs and have a peace of mind during your first few weeks in the UK. Whether you need basic assistance to get started or a guaranteed job, almost everything is possible with Easy Start UK. This package is tailored to independent individuals who like to get started on their own. Global Choices will set up everything you need before you even arrive in the UK, but except for that, you will stand on your own feet. This package is meant to give you basic assistance with your trip to the UK, but adds a feeling of financial security. In addition to the benefits of the Basic Package, you will get the Work Placement service: Global Choices will find a job for you once you arrive in the UK. This package adds that little extra bit of comfort to your trip. You won’t need to worry about how to get from the airport to the city or where to spend your first night. In addition, you will get a phone card right after arrival, so you can tell your family and friends you’re alright! This package combines the advantages of the Deluxe Package with our Work Placement service. It is the most convenient way to travel to the UK, as there is nothing you have to rack your brains over! To ensure you will get your job, we will need your CV and photo at least 2 weeks prior to your arrival in the UK! In London, you will have a telephone interview to qualify you for a job. The result of your application will then be used to assess which job suits you best.